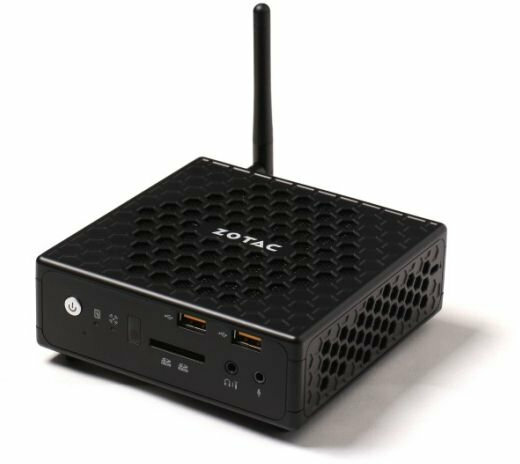 Zotac has announced four new fanless mini PCs part of their new ZBOX C-Series family with low power AMD A6-1450 APU and Intel Celeron “Bay Trail” N2930 SoC, as well as two more power models with Core i3/i7 processors, all of which in the same form factor and with price starting at $150. All models come with HDMI & DisplayPort outputs, a 2.5″ SATA bay, a 3-in-1 card reader, 802.11ac Wi-Fi & Bluetooth 4.0, as well as Gigabit Ethernet. The base models are barebone, but there are also “PLUS” models with 4GB RAM and a 64GB SSD. Dimensions are 12.7 x 12.7 x 4.57 cm. The operating system is not pre-installed, so you can install your preferred Linux distributions or Windows OS. You can check all the models on Zotac ZBOX C-Series product page.